The VNG JSC has announced the completion of the sale of 355,820 shares with an average selling price of VND1.8 million ($77.4), higher than the VND800,000 ($34.4) minimum offering price, which its General Meeting of Shareholders has passed. The buyer is Seletar Investments, a subsidiary of the Temasek Investment Group, owned by the Singaporean Government. Seletar now owns 1.74 million shares, equivalent to 5.04 per cent of capital and 6.35 per cent of shares. Another investment unit related to Temasek, Gamvest Pte. Ltd., also holds a 10.25 per cent stake in VNG. The result of this offer, reaching VND662 million ($28.5 million), will be used to expand VNG’s presence in domestic and foreign markets as well as serve some future investments. VNG still holds more than 7.1 million of the total of 34.54 million shares issued. If calculated by the average selling price after this last sale of treasury stocks, VNG is valued at about VND64.4 billion ($2.77 billion). In March 2017, VNG signed a memorandum of understanding (MoU) to list shares on the US stock Exchange, but an announcement is still to come. VNG specializes in the publication of online games and this remains its main source of revenue. In recent years it has invested in many new companies, such as the Zalo app, payments, e-commerce, and advertising. In 2018, VNG recorded revenue of VND4.3 trillion ($185.2 million), roughly the same as in 2017. 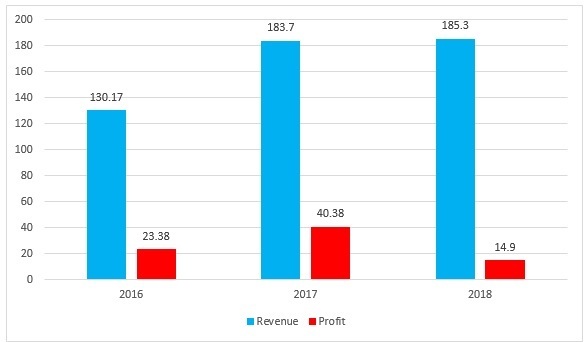 Pre-tax profit, however, fell sharply, from VND938 billion ($40.4 million) to VND347 billion ($14.9 million), primarily because the company spent a lot of money on sales activities. It lost VND44 billion ($1.9 million) in the fourth quarter of 2018 after a long period of continuous profit in the several hundred millions of dollars each quarter.